This LED Light Strip Expansion allows you to take your Plug and Play Light kit even further! Our light strips are made of dozens of incredibly bright 3528 SMD LEDs. The strips are then thoroughly coated in silicone to create a waterproof seal. At the ends of the strips are our expansion connectors that allow you to add these light to your existing kit. On the bottom of the strip is a self adhesive 3M tape backing which makes installation quick and easy. Getting the right length of lights is always important, which is why our strips can be cut after every 3 LEDs to get the right length every time. 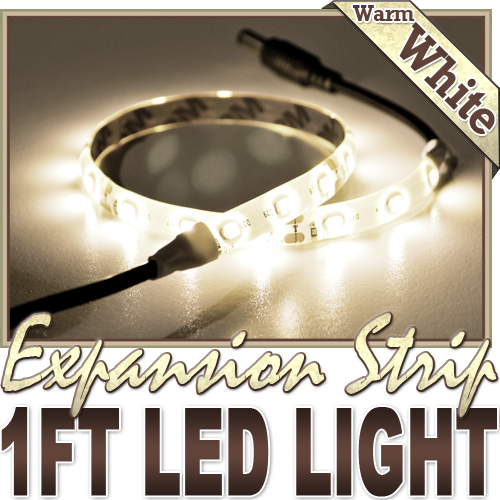 This LED Light Strip Expansion allows you to take your Plug and Play Light kit even further!